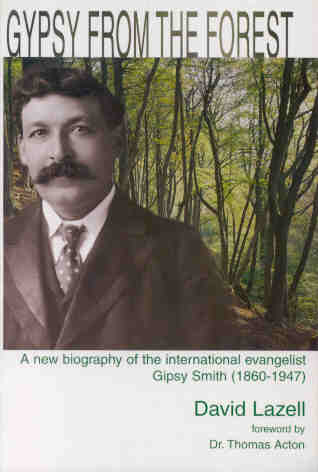 Romany’s uncle on his mother’s side, Rodney Smith, was the internationally famous Evangelist ‘Gipsy Smith’. Gipsy had travelled in every continent, particularly North America. 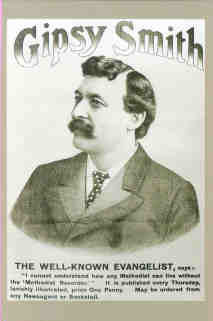 Born in a tent in Epping Forest in 1860, Gipsy became one of the best-loved preachers of his day, and was a world-famous gospel singer. Gipsy died, aged 87, on board the Queen Mary in 1947. The event is rumoured to have been to been his 45th transatlantic crossing! 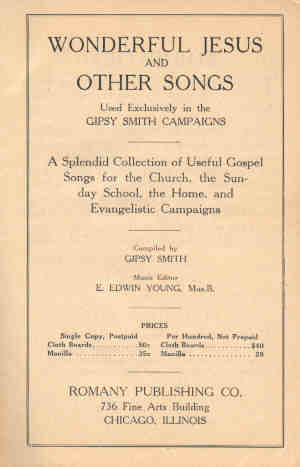 The page below is the title page from one of his song compilations ‘Wonderful Jesus and Other Songs. Published in 1927, this contains 245 songs with music. It includes both God Save the King and The Star-Spangled Banner, perhaps reflecting his wide-ranging appeal and travels. Note the ‘Romany Publishing Co’ and the Chicago address. One of Gipsy Smith’s song compilations ‘Wonderful Jesus and Other Songs. Note the ‘Romany Publishing Co’ and the Chicago address. For more information on Gipsy Smith, try this book by David Lazell, published by Gwasg Bryntirion Press in 1997 (ISBN 1850491321).